Chris spoke to us on Thursday 30th August and blew us away with his magical skills. In 2009 Chris Dinwoodie passed his audition for The Magic Circle with a score of over 90% and was thus awarded the degree of Associate of the Inner Magic Circle. He was the first magician to win both of the largest close-up magic contests in Scotland in the same year, making him The Scottish Table Magic Champion. He was also the first Scottish magician to win the Scottish Conjurers Association's Close-up Magic contest 3 years in a row (2007-2009). 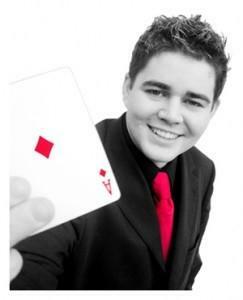 He is one of the few full-time professional magicians in the UK specialising in magic for adults. Chris Dinwoodie specialises in close up magic and also is an entrepreneur who provides an absolutely fascinating (and at times baffling!) presentation on how he opted for and has gained continuing success in his chosen profession.